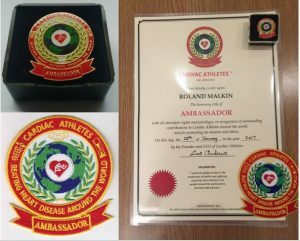 The title of ‘Ambassador for Cardiac Athletes’ is an elite member status for long term loyal members who have provided significant service to Cardiac Athletes. These members have demonstrated high standards of professional development and commitment to the goals and long range activities of Cardiac Athletes. To recognise the member who exhibits a deep and ongoing interest and dedication to the goals and long-range activities of Cardiac Athletes. To reward loyal members who are regulars advising and guiding newcomers to our forums and who have not broken away and tried to create their own personal group taking our members with them. To more clearly identify ‘the’ ‘go-to’ ‘patient-expert’ for medical professionals to discuss matters of importance. To be the public voice of Cardiac Athletes in the media. To be trusted ‘bridge-builders’ between the world of Cardiac Athletes and the worlds of cardiology, sports cardiology, cardiac rehabilitation and sports medicine. The idea to create CA Ambassadors evolved because a multinational and transcontinental charity just was not working. The main reason being “fairness”. If a team of Cardiac Athletes managed to raise substantial donations in one country and then a new AED-defib was placed in a different country, this just would not be fair. Better then to create leaders in various locations across the globe who could take a more active local interest and make positive changes in their own neighbourhood. The candidate should consider the application for advancement to Ambassador status to be a request to become more active in the internal affairs of Cardiac Athletes, including serving in a leadership capacity. An applicant should not consider Ambassador status as a final step or for personal gratification or enhancement. Persons applying for Ambassador status should have demonstrated a high level of competence and ethical conduct with acceptable knowledge of the principles and practices of sports cardiology. 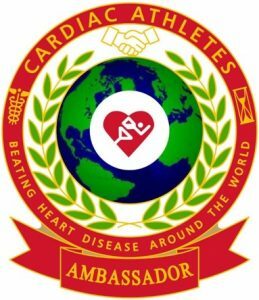 The reputation of Cardiac Athletes has been entrusted in you the CA Ambassadors. The future success of Cardiac Athletes is now in your hands. For those considering applying, there is a formal application and review process. Applicants must meet the minimum requirements for an application to be reviewed. Meeting these requirements does not guarantee advancement, only that the application will be reviewed. Reviews are completed twice a year. Deadlines to apply are February 1 and August 1. Additionally you will be listed on the CA Website ‘Register of CA Ambassadors’ page along with your Sports Cardiology ‘Resume’. *(Paid from CA Book sales and our Donations link). Cardiac Athletes want their own ‘World Heart Games’ &/or ‘Special Olympics’. We are ready, NOW! and many other initiatives suggested by … the CA Ambassadors. So how many points have you scored so far as a CA Ambassador ? None of this is set in concrete yet so feel free to discuss your ideas and make suggestions on our CA Members Only Facebook Group page … thanks. Lars.